Valet. > Style > Profiles & Features > Check Out: Caputo & Co.
Leather bracelets from $50; belts from $125 and bags from $250. On a recent trip to Unionmade, we stumbled upon some handsome accessories by Manhattan-based designer Alex Caputo. His new line, Caputo & Co., is centered on merging function and design with social responsibility. Caputo, who was born in Venezuela, is partnering with non-profit groups like Comunidades de la Tierra in Guatemala to develop fabrics and provide jobs to local artisans. The results not only look good and do some good in the world, but they're clever design solutions—like reversible belts and weekender bags with adjustable straps. For his coming spring collection, Caputo explored the local markets of Buenos Aires and Argentina, sourcing textiles and wax cording, which is reflected in the collection's colorful platte. 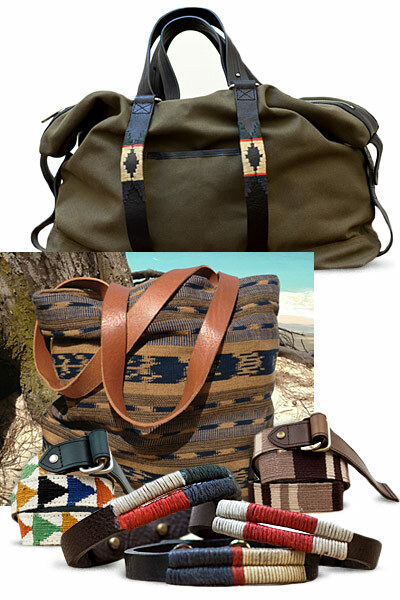 That means the belts, bags and bracelets don't just look very of-the-moment (well-traveled with a touch of bohemian style and ethnic prints), but there's an authenticity and handmade feel to every piece. The belts and bracelets even come packaged in handwoven textile pouches. Caputo & Co. is available in store at Unionmade, Barneys Co-Op, Scoop and Bird.